In May ProModel joined a diverse and talented group of healthcare professionals in Las Vegas to share best practices for improving process and positively impacting the quality of patient care. 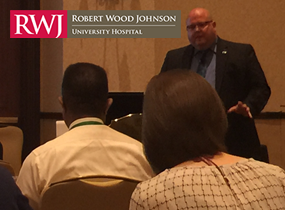 Presenters provided views on a wide variety of patient flow issues including population health management, RTLS systems, healthcare reform, readmissions, surgical variability and ED processes. Not only did ProModel have an exhibit at the event where we were able to officially unveil our new Patient Flow RX solution, but we were also very lucky to have ProModel client and user David Fernandez MHA there to give an insightful and informative presentation on his successful use of simulation in the healthcare world. Fernandez is VP of Cancer Hospital, Neuroscience and Perioperative Services at Robert Wood Johnson University Hospital and his presentation “Let My Patients Flow! Streamlining the OR Suite” described his use of lean management principles and simulation modeling to improve patient flow in the OR. Among numerous other presentations, keynote speaker Eugene Litvak PhD, President & CEO of Institute for Healthcare Optimization was there to address the application of queuing theory to healthcare processes, as he believes it is a methodology that will correctly address the challenge of hospitals to match random patient demand to fixed capacity. 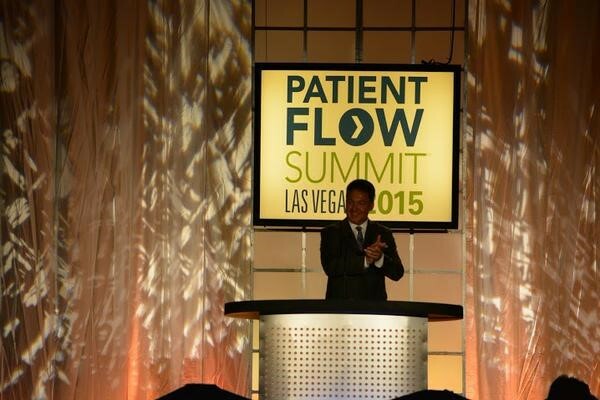 The Patient Flow Summit helped hospital leaders from all over the world learn the latest about optimizing capacity, streamlining operations, improving patient care, and increasing fiscal performance. 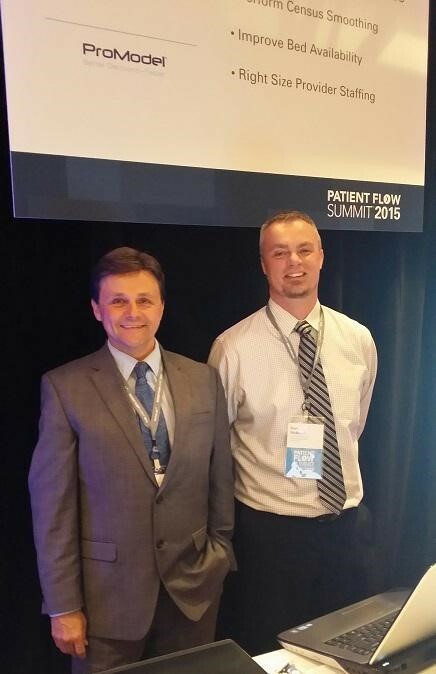 ProModels (L) Kurt Shampine, VP and (R) Dan Hickman, CTO – unveiling Pateint Flow Rx! This entry was posted in Healthcare and tagged custom software, discrete event simulation, Healthcare, Patient Flow, Predictive Analytics, prescriptive analytics. Bookmark the permalink.